New York City's first charitable concept store supporting ethical consumerism featuring niche brands from 100 artists where 10% of all sales are donated to a vast variety of charities. The boutique spotlights 100 chic products neatly displayed under ten categories: books, single-batch fragrances, hand-poured candles, housewares, gifts, mens accessories, jewelry, bags, wellbeing, with the last category "rotating", where all items in every category are refreshed every 10 weeks. The high wall space also serves as a fine art gallery for emerging artists. Located on the same block as the Ace Hotel, New York — the perfect place to indulge in shopping for luxe gifts and goodies for yourself and others. Monday – Saturday: 9 a.m. - 8 p.m. | Sunday: noon - 6 p.m.
Exit 28th Street; walk 1 block north up Broadway to W 29th Street; walk 3/4 block east (go right) across w 29th Street toward 5th Avenue; MAISON 10 is located between Broadway and 5th Avenue (nearest to 5th Avenue) on the south (right) side of the street. Exit 34th Street Herald Square; walk 4 or 5 blocks south down Broadway to w 29th Street; walk east (go left) across w 29th Street towards 5th Avenue; MAISON 10 is located between Broadway and 5th Avenue (nearest to 5th Avenue) on the south (right) side of the street. The boutique spotlights 100 chic products neatly displayed under ten categories. Every category features ten items consisting of books, single-batch fragrances, hand-poured candles, housewares, gifts, mens accessories, jewelry, bags, wellbeing, with the last category "rotating", where all items in every category are renewed every 10 weeks. 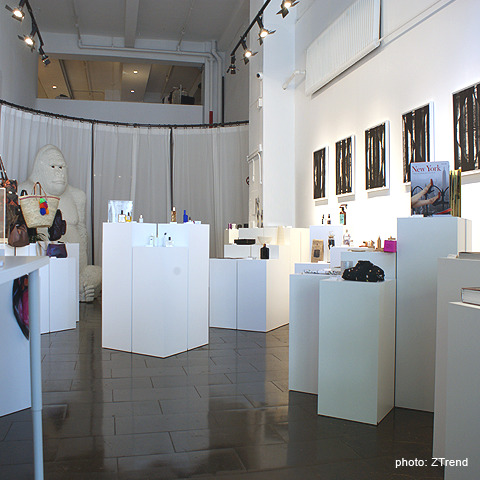 The high wall space also serves as a fine art gallery for emerging artists. Each object is displayed with a product information tag indicating the designer's name and location. On the reverse side of the card is the artist's preferred charity. The customer gets to pick the charity they want to donate ten percent of their purchase to from a list provided by MAISON 10, or they may select from one of the 100 charities suggested by each featured artist. Music is the inspiration for the project MAISON 10, the charitable concept store. Co-owners, Tom Blackie's, Carsten Klein's, and Henri Myers' shared affection for music, following Billboard's top 10 songs in each of their home countries (the UK, Germany and the US), sparked the idea to create a store based on the numeral "10". Their love of music combined with love for humanity is recognized through the boutiques charitable actions donating proceeds to many organizations, and each personally fundraising and giving time to charities such as SAGE, Housing Works, and Opening Doors, London. With their combined creative backgrounds in PR, styling, graphic design, and connections with artists, the guys not only have the eyes for the goodies but hearts of gold.